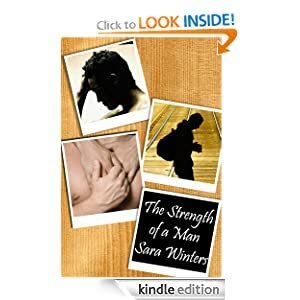 This is the first book I’ve read by Sara Winters, and I have to say I’m impressed by this short story. She really captures the angst and emotional trauma that one of her heroes, Kurt, goes through, and even though they’re a lot of things going on with him, it’s not overly done and the romance between Kurt and James really made this a lovely read. Kurt has recently come out of the closet to his parents and to his dismay and heartache, they have rejected him. As a member of his college swim team, his performance at meets and practice has suffered because of Kurt’s pain. He believes he’s about to be kicked off the team and is starting to think that there’s nothing positive in his life, the captain of the swim team, James, steps in and offers to give Kurt some pointers and help him. Soon, James and Kurt fall into a fast friendship and their relationship starts to evolve into something very special. But Kurt’s hurt and anger often keeps him from totally trusting and opening up to James. Lucky for him, James is a very patient and understanding person, so hopefully with a little love and acceptance, Kurt will begin to believe in both himself and in the relationship he and James have together. Will Kurt be able to work through his past hurts and open himself to the love that James wants to give? I really liked this book. When it comes to the story in general, it’s not always an easy read. Kurt’s life is filled with sadness, anger and confusion, and this brought out all of my protective instincts for him. I just wanted to grab him and adopt him for myself. At the beginning of the story, Kurt feels a lot of loss and self-loathing, but with James’ guidance he begins to work though his pain and starts to evolve into a more confident man. I thought the drama between Kurt and his parents was well written and I often felt sorry for Kurt and the hell he went through. Even though there’s a lot going on with him emotionally, in the end Kurt still proves that he’s able to stand on his own and be proud of who he really is. I enjoyed watching him evolve into a stronger person and thought he was an all-around likeable and sympathetic hero. James is a total doll. He’s truly perfect for Kurt. He’s supportive of Kurt without smothering him with over sympathetic gestures. He allows Kurt to grow and change at his own pace and ended up being the boyfriend that most people would be proud to have. I really enjoyed the roller-coaster ride of emotions the author gave me while I read this book. I do wish the book had been a little longer. The ending was a big rushed for me. I wish there has been an epilogue or a least another chapter or two instead of the quick summary at the end. But otherwise, the story moves along quite quickly and is well-paced throughout. I thought the trauma that Kurt goes through was realistically written as well as the steps he took to overcome it. Recommended!